The exhibition is set up in the Salone Borghini of the Museo degli Innocenti. The Museo degli Innocenti was the first secular institution in the world to deal exclusively with helping children. 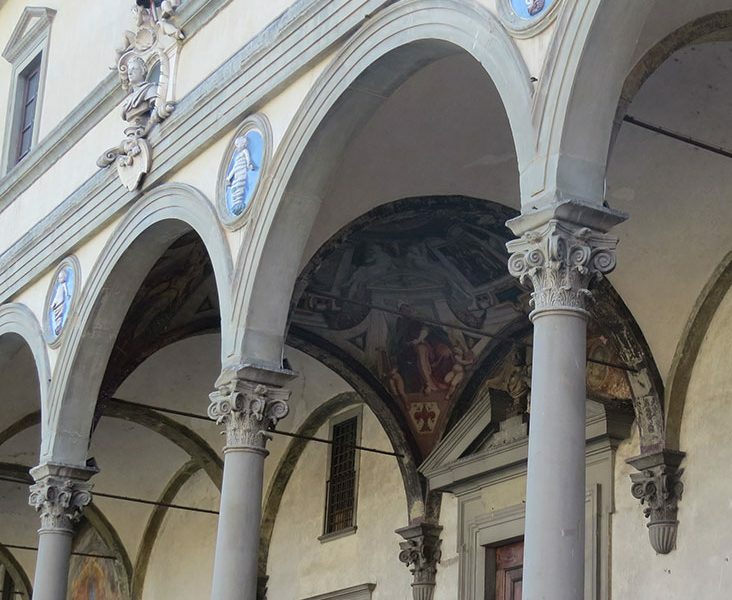 The important patrimony preserved since 1419, the year of the foundation of the Spedale, was restored and enhanced, so as to offer a new museum in Florence dedicated to the history of one of its oldest and most innovative institutions. Thanks to two new entrances opening onto Piazza Santissima Annunziata and the realisation of vertical passages, the museum has made the artistic, monumental and historic patrimony of the Institute fully accessible and offers many services to the city: artistic workshops for children and families, temporary exhibitions, an accommodation point for residents and tourists who want to visit the city, conventions and training activities, a specialised bookshop for children and teenagers, and a cafeteria in the 15th-century loggia. On the underground level, a historical itinerary recounts the evolution of the Innocenti and of childcare, from the foundation of the institution to the present day, also through the reconstruction of around one hundred biographies of children that this place has accommodated over the course of six centuries, presented through multimedia. Unlike the previous itinerary, the new itinerary tells the entire history of the institution from the 1400s until today, explaining how the ancient Spedale, which then became Brefotrofio, has finally become a point of reference at a national and international level for childhood and adolescence. In the courtyards, an architectural pathway unfolds, allowing for an investigation into the history of the Fabbrica and the operations that have adapted the spaces over time to the needs of the refuge. The gallery above the portico of the hospital’s façade, now housing the last part of the itinerary, is dedicated to the most important works and to the prayers of the nurses. The museum houses about eighty works, including masterpieces by artists such as Luca and Andrea della Robbia, Sandro Botticelli, Domenico Ghirlandaio and Piero di Cosimo. The process of creating the museum was preceded and accompanied by great research into the history of the institution and of all the artistic and cultural heritage displayed. This study guided the project of resorting most of the historical building and of around 50 works, including the 10 Putti by Andrea della Robbia on the façade.